Ford is planning on revealing two new powerplant options for 2015. Ford’s new standard V-6 is another power packed engine. This engine will provide 283 horsepower and 255 pounds-feet of torque, as per the sources. That means the pick-up truck with this engine will be capable to tow 7,600 pounds and carry up to 1,910 pounds together. 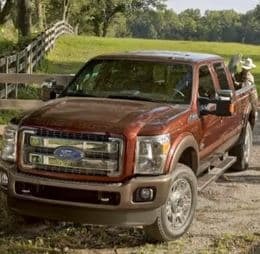 According to Ford, this capacity rate of V-6 model will be the best-in-class tow rating for all light-duty pickups. Ford also revealed details about the new power option of the new turbocharged 2.7-liter EcoBoost V-6. This model, however, is rated at 325 hp with 375 pounds-feet of torque. No wonder, this engine is powerful. With its 2.7 L engine, the EcoBoost V-6 system will be as powerful as a mid-range V-8 engine. Ford reveals that the engine can pull 8,500 pounds and haul up to 2,250 pounds. The company is expecting that this powerful engine is likely to be its volume engine. After the details released from Ford, this powerful engines are now compared to three major competitors, including the 2014 Ram 1500 EcoDiesel featuring 3 L turbo-diesel V-6, the famous 2014 Chevrolet Silverado featuring 5.3 L mid-range V-8 and the 2015 Toyota Tacoma 4×4 with its 2.7 L four-cylinder engine. The company also released a video showing the performance of Ford pick-up trucks of 2015 line with this power-pack v-6 EcoDiesel engine. This video also shows the performance of the mentioned Chevy truck and Toyota Tacoma. The video clearly shows that the Ford powertrain outflanking out of the three. However, the only drawback of this video is that Ford didn’t include any fuel economy numbers. To give details on that, Ford is most likely to hold another press conference in the near future. Ford also gave a detailed comparison of weight between the outdoing trucks and their new 2015 models. Two of their two-F 150 Lariat models with EcoBoost V6 were compared to a 2014 crew cab with 5 l V8 engine. The result clearly shows that the Ford trucks with these new powertrain engines weigh 732 pounds lesser than the other models. This is certainly good news for many of those Ford pick-up truck fans out there.